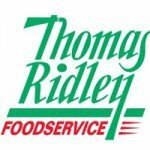 Food service distributor Thomas Ridley Food service is realising major performance improvements and savings of more than £175,000 p.a. following a major investment in Accord® Voice Directed WMS software from supply chain software and warehouse management systems specialist BCP (Business Computer Projects Ltd). Founded 200 years ago, Thomas Ridley remains a family owned business, but has grown to become one of the UK’s leading independent delivered wholesalers. It uses its own fleet of 45 temperature controlled vehicles to provide a multi-temperature delivery service to caterers across England with a comprehensive product range of chilled, ambient, frozen professional hygiene and catering sundries. Customers include schools, hospitals, pubs and restaurants, care and residential homes, and the leisure sector. 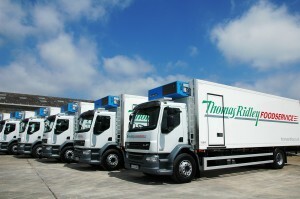 Committed to delivering the best possible customer service, the investment in Voice was prompted by Thomas Ridley’s expanding customer base and, in particular, by a desire to increase accuracy in order to improve the customer experience, ease out of stocks and reduce the costs associated with rectifying incorrect deliveries. Although using computerised stock control and RF scanning for Goods Receiving, manual, paper based procedures were still in use for other warehouse operations. Though efficient, these were still subject to human error – a significant factor for an operation the size of Thomas Ridley where 1000 deliveries per day are assembled from over 10,000 different sku’s. Aware of the reputation of BCP’s Accord Voice warehouse management system and BCP’s pedigree in the foodservice sector, Thomas Ridley decided to invest in Accord Voice WMS with Vocollect T5 hardware for all warehouse operations from put away through picking and replenishment to stocktaking and perpetual inventory. 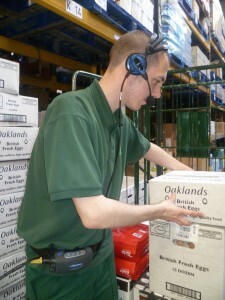 BCP worked closely with Thomas Ridley’s in-house IT team to phase the system in over the course of a 12 month period, starting in the most complex department – frozen goods – followed by the chilled department and finally, the largest of the three departments, ambient goods. Once checked in by RF scanning, goods in the 100,000 sq foot warehouse are now managed entirely by Voice, with 65 workers using the system. There have also been major stationery and administration savings as the use of paper lists and associated tasks such as printing and distributing lists and re-keying picking confirmations and order amendments have been removed. Overall, Thomas Ridley estimates a massive 10% saving in labour costs with the introduction of Accord Voice WMS. The new technology has been readily adopted by warehouse workers and training of new workers is now much faster, allowing them to become productive much more quickly.